December | 2010 | Crabbish. And Quixotic. 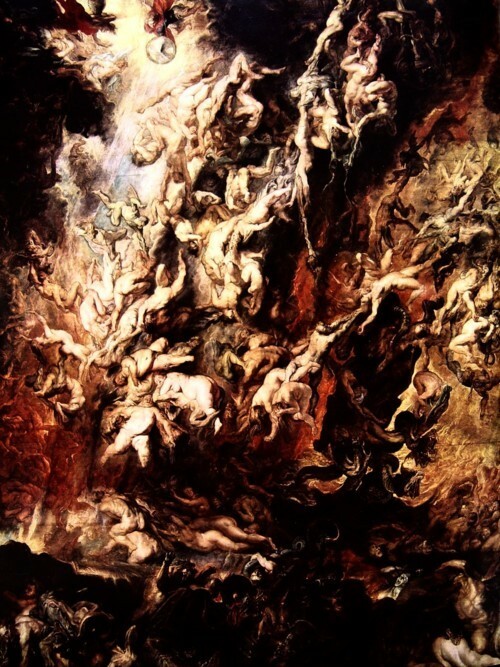 The painting depicts one of the mythical episodes surrounding the history of ancient Rome. The city has just been founded by Romulus, and the Romans wish to ensure the future prosperity of their young nation. As there is a lack of women to provide the necessary offspring, they plan a mass abduction. With this in mind, they invite the neighboring Sabines to a feast during which they seize the women and drive off the men. Three years later, the Sabines attack Rome in revenge. But the conflict is prevented thanks to the women, who stand between their brothers and their husbands (to whom they have become reconciled). Thus peace was achieved between the two peoples. 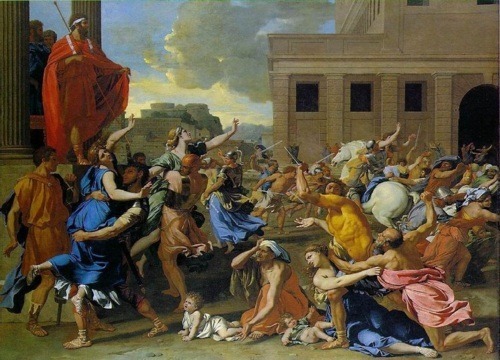 Poussin has chosen to illustrate the scene of the abduction. Romulus stands on the left, dominating the proceedings, in a pose directly inspired by Imperial statues. In the central section, the painter emphasizes the panic and confrontation between the men and women. This all takes place against an architectural background in linear perspective, which gives the work its vanishing point. Also of interest is the way the artist has organized the figures, using two diagonal lines that start from the edges of the picture and join up where there is a gap in the landscape, thus making the work more dynamic. The present painting appears to be a self-portrait. Two later self-portraits depict the artist as a bearded man with the same turn of the head, strong nose, and most of all a distinct frown and intensive stare. “Le beau Flamand” he was called in the Parisian studios, an epithet which would fit the present portrait. The significance of the chain, however, remains enigmatic. 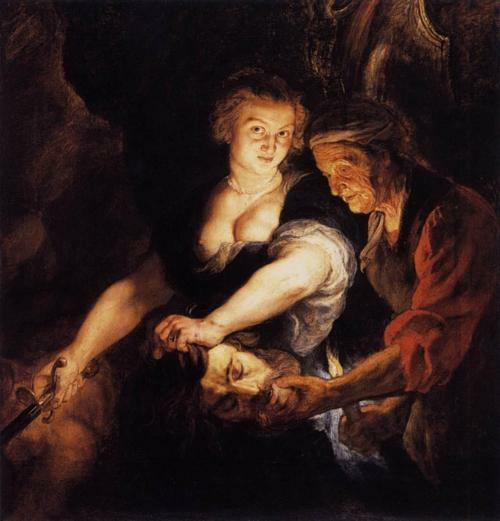 The account of the beheading of Holofernes by Judith is given in the deuterocanonical book of Judith, and is the subject of numerous depictions in painting and sculpture. In the story, Judith, a beautiful widow and chosen by God, uses her charms to enter the tent of Holofernes, an Assyrian general out to destroy Judith’s hometown. Overcome with drink, he passes out and is decapitated by Judith; his head is taken away in a basket (often depicted as carried by an elderly female servant). “Frankenstein would want your mind. Stunning light effects. Deep Chiaroscuro. An absolute favourite by the Dutch Master. Gerard van Honthorst, a well known Dutch Caravaggisti, often painted scenes of merry making and gatherings, complimented beautifully with contrasting lights and shadows. Truly, his works are captivating and beautiful. What I personally love in these paintings are his animated and often drunk subjects. What are they thinking? What could they be saying? You can look at these works and always find something new to surprise you, a new expression, a new meaning. Baroque at its best. ‘They fall from your mouth, propelled by your belly and your tongue. Are you human? Or did you make it up?